In its humble beginnings, the Watermen project came out of a desire to be of service in the effort to protect our oceans for future generations. Along the way, it became clear that there was no simple solution nor simple approach to the large and global challenges of ocean conservation. When we took notice that people from all walks of life and all ages responded best to the plight of the ocean when presented to them in story form, we shifted the way we operated. Over the years, through thousand of hours of collecting photos and filming our expeditions, we documented honest interactions with large marine animals in their natural environment. This is what made us realise that our calling was in becoming full-fledge storytellers. Today, we continue to learn and evolve as an organisation dedicated to ocean conservation. Using compelling stories and conversations, we motivate people of all ages to volunteer their service in the preservation and conservation of all habitats but most importantly to inspire and demonstrate a love for all things in the ocean. We measure the missions’ success by the impact that our educational programs has on young people and children. Through our guidance and real life tools they feel self-empowered and understand they can easily make a difference. is an ocean explorer and storyteller who works to motivate future generations to protect and respect our oceans. 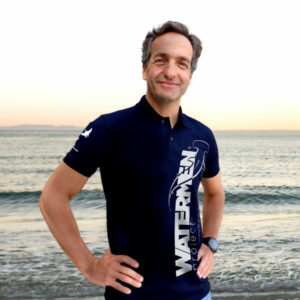 He is an IUCN Oceans Ambassador, Fellow International of the Explorers Club and founder of the Watermen Project, an NPO dedicated to ocean conservation. An accomplished photographer and filmmaker William spends his time traveling the world for exploration/conservation related projects and events, conferences and expeditions organized for the Watermen Project. He has been exploring the underwater world and sharing stories of his endeavours on a single breath of air for more than four decades. William gives talks and teaches on topics ranging from risk and stress management to optimized breathing and breath-hold diving. Winram has been featured in the IMAX film Great White Shark 3D and has regularly appeared in programs on National Geographic channel, Discovery Channel, ABC Nightline, Arte, as well as publications such as Maxim, the LA Times and The Age to only name a few. Michele is a founding partner, a passionate woman with impeccable vision for management and project development, who still finds tme to be an advocate of human health and environmental censervation. Born and raised in land-locked Switzerland, she grew up terrified of water following an incident during a swimming lesson at the tender age of four. Many years later, like many others, Michele discovered breath-hold diving through the movie “Le Grand Bleu”, though it left her with feelings of panic. In 2002, after her first visit to the Big Island of Hawaii, she felt the need to face her fears and thus began her journey, which meant she first had to learn to swim. This would eventually lead her to dive off shore in the company of sharks and manta rays. 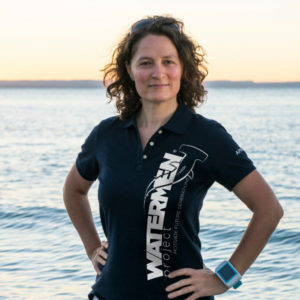 In 2008, she took her involvement in freediving one step further by taking responsibilities as a board member of the Canadian freediving federation AIDA Canada until 2015. Although she was an active judge for AIDA International at freediving competition for several years, she favors recreational freediving as a tool to connect with the underwater world. A nature lover since always, she became actively involved in ocean conservation when she started raising funds and organizing expeditions in support of scientific research and documentary filming. Michele is based out of Geneva, Switzerland. She holds a BSc (Hon) in Biology from the University of Waterloo, Canada (1997). Lukas is certain that his curiosity for nature runs in his DNA, but that his passion for exploration was nurtured throughout his childhood. It’s a family tradition and part of his identity. His profound passion for the ocean and sharks in particular has lead him to embark on adventures around the globe and lead him to dive in places and with animals he never before imagined to be possible. His focus lies on projects that highlight unique stories and interactions between people and the world’s most iconic ocean species that depend on the health of our oceans, from great white sharks to Komodo dragons. Using science, exploration and digital storytelling he wants to inspire others to leave their comfort zone and start protecting these animals, some of which are on the verge of extinction. Lukas wants to help people get off the couch and do something. Do something that is hard. Do something that is not ordinary. Do something that others may think is ‘crazy’. Even if that ‘crazy’ thing is coming face to face with a powerful predator of the ocean, realizing that we depend on one-another. Whether it’s scientific projects, VR, film productions or a challenging conservation mission, reach out to us and let’s discuss how to make it happen! Angelos is an entrepreneur who is currently involved in ventures in the field of Real Estate and Private Equity with a focus in Europe and the USA. 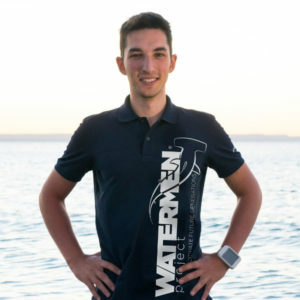 With a strong passion for the mountains as well as the oceans, Angelos devotes a significant part of his private time mountaineering or under-water. Having the possibility to explore nature in an adventurous way is what drives Angelos’ desire to assist in conservation work. Meeting William Winram in 2011 was a wakeup call to the grave condition of our planet’s oceans and he immediately volunteered to be a part of TWP’s journey all the while lending his expertise in social entrepreneurship and fundraising.